Without knowing I bought the compendium to, or second part of, The Poetic Edda. In both books Kvilhaug made her own translations of the famous texts. 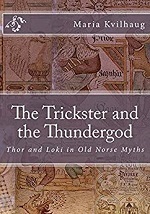 In the previous book “Six Cosmology Poems”, the current title is (obviously) about Loki and Thor. The texts are from the Gylfaginning, Skaldskaparmál, Haustlöng, Harbarðsljód, Þrimskviða and Þhórsdrápa. Karlsson’s books have the habit of going out of print and becoming very expensive. 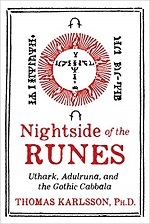 His first book from 2002 Uthark, Nightside Of The Runes is one such work. 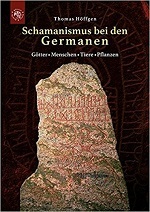 The German translation Uthark, Schattenreich der Runen from 2004 is more affordable, but it appears that the author wanted to make the English text available again. This makes the first part of this book. The second part is Karlsson’s book about Johannes Bureus which has been published in Swedish (2005), German (2007) and Italian (2007). Now finally, this book has been made available for people who do not master these languages. That also means that this is the most extensive information available about Bureus in English. I found this book because it has an introduction by Maria Kvilhaug (a title of herself I have yet to read). The author does not have a very Norse-sounding name and yet it did not ring a bell. This is even more strange, because the author seems to live not too far from where I live, just across the Belgian border. The book is subtitled “an esoteric interpretation of Norse myth” and it is soon clear that this ‘esoteric leaning’ is a Theosophical one. This brings the book in line with The Masks of Odin and Between Wodan and Widar the latter being a more Anthroposophical (and better!) interpretation. Initially Ongkowidjojo’s book appears to have the flaws of Titchenell’s, being too easy with his sources. He names Frigg a Vane for example and drops names that do not ring a bell and cannot even be found in Simek, even though this is one of the sources. It is also obvious that the author knows his sources and has an eye for detail. Perhaps for forgets to double check sometimes. Besides Theosophy there is also a thick layer of psychology in the book and the author uses magical sources such as the books of Aleister Crowley. I have mixed feelings about the writings of Stephen Flowers / Edred Thorsson. Often they are wildly interesting. The subjects he finds and the way he works them out. At other times they are mildly interesting. The latter ‘category’ usually includes Thorsson’s ‘system’ and working for his Rune-Gild organisation. 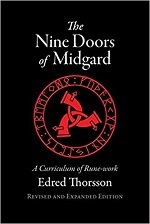 The Nine Doors Of Midgard is a book that you have to work through and report on when you want to join the Rune-Gild. I guessed it would say a lot about the Rune-Gild system, symbolism, etc. and it sure does! The Nine Doors have been revised a couple of times and if I am not mistaken, the 2016 edition is the last one. The “doors” refer to sets of practices and exercises. These often involve meditation and visualization exercises, chanting, runic postures and the like. The book is supposed to form a path to allow the practitioner first to be able to join the organisation (after two or three doors) and later expand his/her magical abilities. The exercises mostly have to be performed for many days, which makes a period of several years to work through the entire book. The Rune-Gild certainly is for people with perseverance only! I thought I heard of this book, but its publication is so recent (March 2017) that I doubt that it was this book. Its publisher also (re)published the Heidnische Jahrbücher (which are sold out), but there have been none since 2012, so that is not where I can have heard about the current title. So, ‘Shamanism with the Teutons’. There is something that you hear about every now and then. According to the author, the subject has never been really well investigated and he aims at filling that gap. I am afraid I have to say that, in my opinion, he does so unconvincingly. Almost three decades after the first edition of his Galdrabók Flowers comes with a follow-up. That book ran out of print rapidly and became wildly expensive. A later reprint (that I reviewed) was pretty expensive as well, but later on the book was again reprinted and it is now well available and affordable. 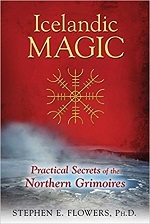 There is also an English and Icelandic edition. Just as in his Galdrabók, Flowers mostly fills the pages of this new book with introductory information. This again is interesting. Flowers made me feel sorry for not having had the time to visit Strandagaldur, the museum of witchcraft and sorcery when I was in Iceland. The fact that this museum exists proves Flowers’ point that Galdrabekur (‘magic books’) have remained popular in Iceland for a very long time. They were influenced by similar books from the continent, from which many spells were taken, survived the coming of Christianity and (even though less popular) the Reformation. Practitioners copied books, added their own spells and sigils and thus created their own books. Quite a couple of them have found their way to the National Museum of Iceland where Flowers studied them. I actually do not know how it comes that it took me almost two years to get Klövekorn’s other book. 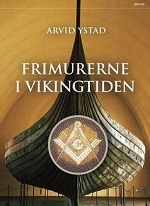 Previously I reviewed his book about Freemasonry. 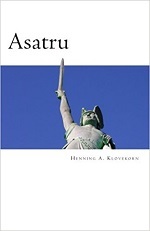 Like the later edition of the Freemasonry book, Asatru is available as a cheap print-on-demand book. The author surely does not want hindrances for people to obtain his writings. 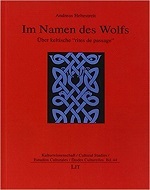 A German book about “rites des passages” focusing on the Celts. Would that be political correctness? Not really, since the author does not shy to refer to Jan de Vries and Otto Höffler and he even uses the term “Indogermanisch” rather than “Indo-European”, so it looks like he really wanted to focus on the Celts. Obviously it is hard to draw the line that firmly. “In The Name Of The Wolf” is a relatively expensive book for its size (125 pages) and does not really seem to contain many new insights. It is good that after Kershaw there are still people conducting research to Männerbünde” and warrior initiations of times passed though. Hebestreit seems to be a well-read and multi-lingual author since he not only refers to titles written in German, but also titles written in French and even some Scandinavian titles. The largest part of the bibliography is in German though. I have known the name of the Norwegian Maria Kvilhaug (1975-) for some time, but never got to read anything of her. 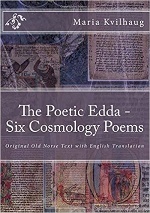 The apparently most interesting title The Seeds Of Yggdrasil (2012) is very expensive and then my eye fell on this very recent (November 2016) little book with “Six Cosmology Poems” that Kvilhaug had translated herself. What is more, she put the original text and her translations side-by-side and added notes to explain why she made the translations the way she did. There is a need for these explanations, because Kvilhaug does not shy to come up with wholly different translations from what we are used to. 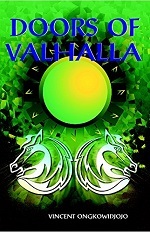 The texts the author translated are the Voluspa, Vafthrudnismal, Grimnismal, Grottasongr, Allvismal and Hyndluliod. In the introduction Kvilhaug explains her position further. The author also sees the symbolism of names and therefor decided to translate most names. The reason is that she thinks the names were not chosen at random, or because they sounded good. Leaving the names untranslated would bereave the reader with some of the depths of the poems. And so Heimdallr becomes “Great World”, Valfadr “Choice-father”, Verdandi “Is About To Happen” and Hoenir… “chicken”.